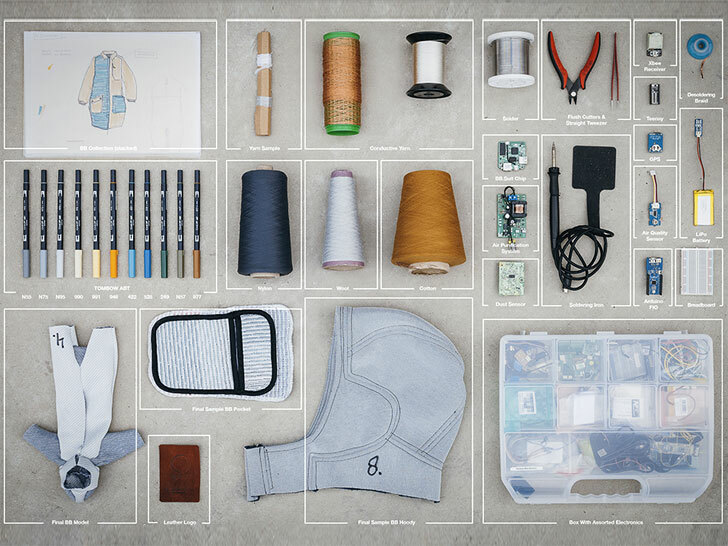 The same three-dimensionally knitted “onesie” that doubles as a wireless hotspot, Global Positioning System tracker, and MP3 library can add another capability to its litany of features: air purifier. Currently on show at Beijing Design Week, the BB.Suit 2.0 uses Squair3’s high-voltage “Cold Plasma” technology to split oxygen and water molecules into pollution-scrubbing free radicals. “Since our clothing is constantly in contact with the air surrounding us it creates an opportunity to clean the polluted air,” writes Want, a Dutch online magazine that worked with designers Borre Akkersdijk and Eva de Laat, Eindhoven University of Technology’s Martijn ten Bhomer, Daan Spangenberg Graphics, and StudioFriso to bring the one-piece garment to fruition. While the BB.Suit isn’t quite ready for commercialization yet, its creators say it demonstrates the potential of clothing for purposes beyond adornment. 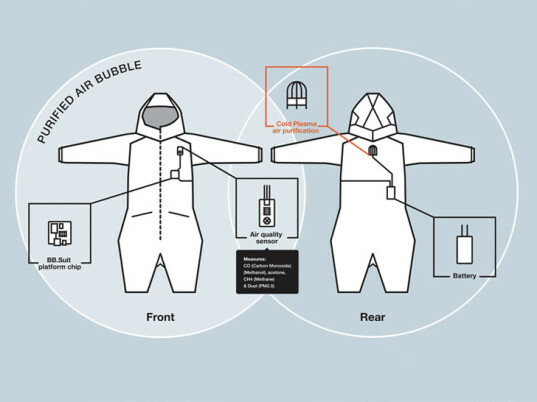 Besides coddling its wearer in a “bubble of clean air,” it could also serve as a means to crowdsource information. A network of suits, for instance, could use the integrated sensors and GPS to map out the air quality of a precise area in real time. Akkersdijk and company trotted out an earlier version of the BB.Suit, which turned its wearer into a walking WiFi access point, at SXSW in Austin, Texas, in March. “We think garments are one of the exciting futures for interface design, connecting the wearer to people and places, becoming the ideal interface for many new user experiences,” Want wrote then. The same three-dimensionally knitted "onesie" that doubles as a wireless hotspot, Global Positioning System tracker, and MP3 library can add another capability to its litany of features: air purifier. Currently on show at Beijing Design Week, the BB.Suit 2.0 uses Squair3's high-voltage "Cold Plasma" technology to split oxygen and water molecules into pollution-scrubbing free radicals. "Since our clothing is constantly in contact with the air surrounding us it creates an opportunity to clean the polluted air," writes Want, a Dutch online magazine that worked with designers Borre Akkersdijk and Eva de Laat, Eindhoven University of Technology's Martijn ten Bhomer, Daan Spangenberg Graphics, and StudioFriso to bring the one-piece garment to fruition.